Below is a letter to the editor I wrote this week for local newspapers. I have received so many calls and emails about a Great-horned owl that was killed by geese, apparently while trying to kill goose. During the past few weeks I have been inundated with emails and photos of Golden Eagles chasing prey WAY too large for them to even think about. It appears there may be confusion and perhaps lack of understanding as to what is actually occuring. I thought I would offer some facts about owls and eagles in a letter to the editor. That is what you will find below. A story ran recently on the front page of the Pioneer Express. It was about Nga Walker, her geese and the Great-horned Owl. In the end the geese killed the owl. People were questioning how this situation would have occurred. I would like to offer some information on Great-horned Owls; and why the situation may have occurred, as well as additional thought about similar bird and wildlife issues that may not have been completely understood. This is the time of the year wildlife rehabilitators like myself refer to as " the dying time". At this point birds and other animals that live in the Northwoods throughout the winter, including Great-horned Owls, have survived the harsh winter season. Many, however, are running on "empty" or at best have marginal fat reserves left from the fall. This is especially true for animals going through their first winter. They lack experience. Many will not survive to spring. Others are brought into wildlife centers such as Raptor Education Group, Inc. for care. Adult owls separate from their youngsters in the late fall. The young fend for themselves all winter. It is a good test for them, but a sharp learning curve. Only the strongest and smartest will survive to reproduce when they reach adulthood. This is as nature intended. While it is natural, birds and other wild animals that are surviving marginally may do unexpected and uncharacteristic things that may at first be misunderstood. They are at a point of doing whatever it takes to survive. This young owl may have taken some unusual chances recently. This time she lost. Another factor in in play for Great-horned Owls right now. This species is the earliest to nest in the Northwoods . They lay eggs in late January and by late February may have little ones in the nest. This is a serious time for an owl family. The adults have strong fidelity to each other and their home territory. They defend that territory with vigor. This is not only to protect their owlets, but to protect their "food " supply for the growing appetites of their young. Great-horned owlets eat 13-17 mice a night EACH, by the time they are 3- 4 weeks old! They keep their parents very busy and the rodent population of the area in check. You can think of it as living in a wonderful garden from which you hope to feed your family through the rest of the year. You may not welcome neighbors picking the crop outside your home, when you need it for your own family. At the same time as the owl experience has made headlines, there are many photos circulating on the Internet and some are creating a flurry of comments from viewers. 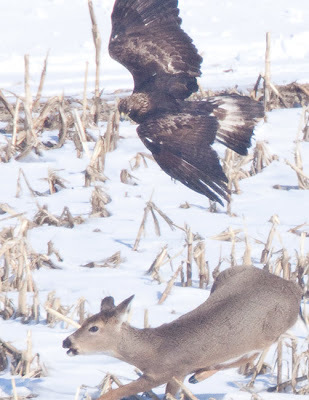 One shows a Golden Eagle in Illinois apparently trying to take a full-size deer. Another set of photos has a Golden Eagle in Montana trying to chase a fox from a carcass. In both cases, the birds involved are in their first year and inexperienced. They are exhibiting abnormal or atypical behavior hoping to beat the odds and survive. Starving is serious business for any species. Sometimes unconventional methods are used, even with disapproval of others. Eagles and owls are not the only ones in survival mode at this time of the year. Mammals too are trying to survive until warm weather returns. Life in the wild is hard-won. Given some thought, it is easy to comprehend the challenges both wild and domesticated creatures face on a daily basis as they try to find ways to survive. As well as understanding owls and eagles, chickens, geese, small livestock, and pets should be monitored when outdoors, or even better protected in fully covered pens. By knowing the reasons behind the behavior of birds and animals you can better interpret unusual or unexpected situations. Wildlife not only enhances our life but the economy of our area. It is worth learning about their circumstances, understanding the reasons behind particularly odd behavior, and incorporating common sense elements that will allow everyone to live peacefully together. Executive Director Raptor Education Group, Inc.